Civil society in the MENA region has faced unprecedented challenges in the years following the Arab uprisings. Political, economic, and social instability in MENA has led many Arab countries to target civil society organizations (CSOs) as potential threats to traditional, institutionalized power structures. In some countries, governments weakened by political and economic tumult have sought to limit CSOs as de facto sources of dissent or opposition. This tendency is manifested formally through legal restrictions on the establishment, functioning, and funding of CSOs, and less formally through misapplication of those legal tools, through administrative impediments as well as harassment of CSOs. 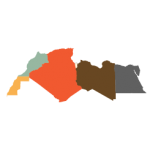 Against this backdrop, the International Centre for Not-for-Profit Law commissioned Triangle to conduct a piece of research on closed or closing civic spaces in Morocco, focusing on An Assessment on freedoms of assembly, expression and association. This study provides insights into the practical effects of restrictions in order to appropriate entry points for mitigation as well as developing strategies and tools for CSOs to adapt to restricted or closed spaces.